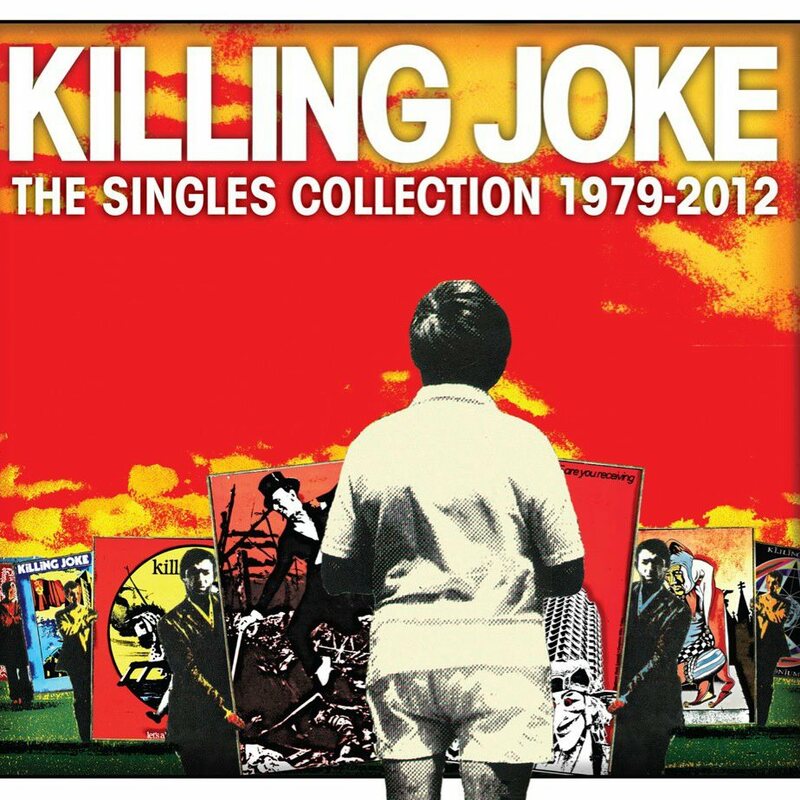 35 Years in 426 Minutes* – Killing Joke: The Singles Collection | "I Prefer Their Old Stuff"
The first time I was made aware of Killing Joke would have been around 1979, the year they released their first album. It was the summer holidays and the family were on holiday down in Cornwall as was the pattern of all summer holidays of my youth. There was a lad I was friends with (can’t remember his name) who I met up with down there each summer and I seem to remember him mentioning them as either he or his brother was listening to them, I can’t really remember. I never heard a note of their music, as a ten year old at the time my only musical exposure was to whatever was on Junior Choice on Radio 1 on Saturday mornings or whatever my older sisters were listening to and as by then the eldest had left home and my other sister only listened to folky stuff like John Denver or The Carpenters my musical tastes were pretty non existant, I just remember the name feeling quite threatening and my young mind thought I wouldn’t like it! Apart from a brief period of obsession over Adam and the Ants at age 12, my musical tastes at school and through the eighties were pretty retro and more than a bit naff, Queen and Genesis were my two loves at the time (yes, I know, I was young!) and listening to early evening Radio 1 while doing my homework didn’t really expose me to anything remotely edgy. Fast forward to 1989/90 and I was working on shift as an IT ops analyst for Barclays and on one weekend shift somebody had brought in a tape of Brighter Than A Thousand Suns, Killing Joke’s sixth album from 1986. This, as far as I can remember, was my first listen to them. I remember being surprised that what I heard totally confounded my expectations (this is of course one of their more ‘gentle’ commercial sounding albums) and I fell in love with it. It became my night time before sleep listen on my walkman for quite a while! So I bought their CD that was released that year, Extremities, Dirt and Various Repressed Emotions and that confounded my expectations once again as this album was much fiercer and heavy than Brighter.. but I loved it. Although, saying that I still did not investigate anything else, neither the two albums between or anything after, I remember buying Fire Dances on a cassette but that was pretty much it until their ‘comeback’ in 2003 with the self titled album featuring Dave Grohl on drums and even though now I consider myself quite a fan, I only heard Pandemonium in full for the first time a few days ago (far too much other stuff to listen to)! As I said in my review of the box set itself (here) the recently released Singles Collection Super Deluxe edition consists of thirty three separate CD singles plus one disc of rarities (which I am yet still to listen to). Thirty of these also contained their relative b sides totalling a sixty three track listening marathon, so I put the kettle on, got comfy and pressed play, and listening to the entire collection was a fascinating journey through their thirty five year career. The one thing that really strikes you when doing this is just how the sound of the band morphs and changes over the span of three and a half decades. Early singles like Nervous System or Wardance are acerbic stabs of electronic tinged punk which fitted with their stark, sometimes controversial imagery, the grainy black and white image of graffiti splashed wall with kids crawling all over it of their self titled debut, or the image of the priest walking between ranks of saluting nazis on their early compilation album Laugh? I Nearly Bought One. Then, as the chronology moves further into the eighties you can see the music changing to accommodate with tracks such as Love Like Blood, probably their most well known song, or anything off the aforementioned Brighter Than A Thousand Suns. This is where for a lot of fans they kind of went off the reservation, Brighter was a stretch for a lot of fans of their harder post-punk output and so following album Outside The Gate, for a lot of people, pretty much stretched it until it snapped. I have to admit to not having heard this album but having now heard the single America and My Love Of This Land off it I’m not really that keen to rectify this! The fury was then brought back with Extremities, Dirt and Various Repressed Emotions in 1990 and to this day this still remains my favourite Killing Joke album, it contained the heaviest and harshest output yet from the band and looking back it signalled their future direction with albums that were to come after the turn of the millenium. The single Money Is Not Our God opens the album with Jaz’s growl turning into a small coughing fit before the pummelling motorik beat comes in that pretty much soundtracks the whole album. This and The Beautiful Dead are included on the collection. The final two albums for this incarnation of the band were Pandemonium which continued the heavier aspects of Extremities and is heavily represented by singles Exorcism (suitably recorded in The King’s Chamber of a pyramid in Cairo), Millenium, Pandemonium and Jana. Why I did not get hold of this album at the time is a mystery, I loved Extremities and Pandemonium continues what I love about it, although, on reflection, 1994 was the year I lost my left arm due to cancer so I guess I had other things on my mind rather than a new Killing Joke record! In 1996 they released Democracy, which is the only album I had not heard one note of, and is only represented by the title track here. This was followed by a seven year hiatus brought to an end with their second self titled album released in 2003, famously featuring a certain David Grohl on drums. This album also finally saw me embrace Killing Joke properly and to follow them diligently ever since! This and follow up Hosannas From The Basements Of Hell (referring to the basement studio in the Czech republic where it was recorded) are easily two of the heaviest albums Killing Joke have ever produced but are only represented by three tracks on this collection. We then reach the two most recent releases that have really brought the band back to the forefront, both albums (Absolute Dissent and last year’s MMXII) got a very good reception from both fans and critics alike, both albums pull off the trick of still retaining their ferociousness and political ire, yet reintroducing more melodic moments, for example European Super State from Absolute Dissent is an electronic dancefloor filler of huge proportions! They both show that although they have been around releasing music for almost thirty five years (aside from a couple of gaps) Killing Joke are still a band to be taken seriously in 2013. If they were to never release another record then this Singles Collection would stand as a fantastic, comprehensive monument to one of the UK’s (if not the world’s) most enduring and exciting bands. But, judging by the reception of the last couple of albums, I feel Jaz and co will not rest on their laurels just yet. I can’t wait for album number sixteen! This entry was posted on July 1, 2013, 1:35 pm and is filed under Features, Music Reviews. You can follow any responses to this entry through RSS 2.0. You can leave a response, or trackback from your own site.